If Alan Gross Dies in Cuba... Who Is Responsible? Raul Castro, Barack Obama, Bob Menendez, Marco Rubio, Ileana Ros-Lehtinen, Debbie Wasserman-Schultz, Mario Diaz-Balart or Joe Garcia? All of the above!!!! But especially the last six. 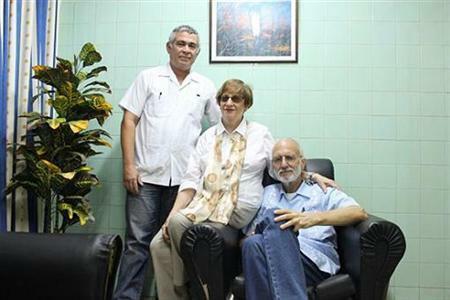 The government of the United States and the government of Cuba should feel deeply ashamed by their inability to find a way for Alan Gross to visit with his mother before her death or to attend her funeral. Either side could have broken the impasse. It doesn't matter which was most at fault. Both lost the opportunity to show they put human compassion first. ...attorney Scott Gilbert said. "He's lost most of the vision in his right eye. His hips are failing and he can barely walk. He has stopped all attempts to exercise. Alan's emotional deterioration has been severe, and his mother's lingering and painful death has only accelerated this." This is not the first time Alan's wife and lawyer have dramatically sounded the alarm about his health. The Cubans correctly point out that the conditions of their three still imprisoned operatives are worse. Nevertheless, there is a sense that time is running out and the consequences could be dire. Ideally the much desired and much rumored negotiated deal can be quickly consummated that allows each country to gain what is most important while maintaining its pride. Under the law when and where they were arrested Alan and the Cuban Five were guilty. The fairness of both trials left much to be desired and the sentences were excessive. The bottom line is that all were witting and willing instruments of anachronistic policies but they have paid an undeserved price because of their governments inflexibility and self-righteousness. The only people who will benefit from Alan's death in prison are the hard liners in Florida and New Jersey who seem to have immobilized the president. Alan went to Cuba on behalf of our government. His immediate release from prison in Cuba and return to the U.S. must be a priority for our nation. Indeed, we believe this is a moral imperative. Our communities are gravely concerned that Alan continues to languish in a Cuban prison nearly five years after his arrest. We ask, with all respect, that you take whatever steps are necessary to ensure a prompt end to Alan's, and his family's, continuing nightmare. This implicit call for negotiations is very similar to a letter sent to the president last December by two-thirds of the Senate, authored by Senator Leahy and including Ted Cruz. The question is whether the inability of the White House to respond is based on ignorance, ideology or political fear. MS. PSAKI: Well, Nicole, let me first say that Cuban authorities have unjustifiably kept Alan Gross in prison for more than four years merely for helping Cuban citizens gain access to the internet, a goal the Cuban Government now espouses. We keep his case at the forefront of discussions with the Cuban Government, make clear the importance the United States places on his welfare. And we engage also with a range of our foreign counterparts at the highest levels and urge them to advocate for his release. So we urgently reiterate our call for the Cuban Government to release him immediately. Did she check with her boss? John Kerry presumably knew when he headed the Senate Foreign Relations Committee that the goal of Alan's project was to set up illegally a network of covert satellite links to the Internet, an important step in the Bush launched USAID "democracy" campaign in Cuba. Judy and Alan no longer buy the spin. The "forefront of discussions" is meaningless unless the US drops rhetorical demands for immediate (i.e. unconditional) release and holds serious negotiations directly with Cuba. Presumably they start with accepting US government responsibility for what Alan was really doing and his violation of Cuban law. Certainly the public words of Washington about Alan, as well as of Havana about the Five, offer little hope for movement because they express no regret. Both countries seem unable to move beyond affirmations of the legitimacy, even moral purpose, of their employees' projects. Each expects the other to act as though its laws are without merit. Neither government fully acknowledges what was done and pledges to behave differently in the future. These deeds confirm that the Government of the United States has not desisted from its hostile and meddlesome plans against Cuba, that it attempts to create situations of destabilization to provoke changes in our political order, for which it earmarks millions of dollars every year. The Government of the United States must cease once and for all its subversive, illegal and covert actions against Cuba, which violate our sovereignty and the express will of the Cuban people to improve our economic and social model and consolidate our democracy. The Miami mantra about Alan is that he is a hostage, arrested as a bargaining chip for the Five. I have argued frequently that, by detaining Alan, Cuba was sending a signal to the Obama administration that it could not at the same time seek to turn the page on bilateral relations and continue with Bush era regime change projects. I believe that initially US acknowledgement of responsibility and a pledge to end similar programs would have won Alan's speedy release. Now, the only way to know whether that would be enough, or what else must be done, is to be in serious bilateral negotiations. "I do know that there are those in Congress with hatred so strong toward Cuba that they are willing to let Alan rot in prison. This way of thinking has failed to bring Alan home for four years and is a death sentence for Alan. ... I urge all South Florida residents to send messages and meet with Senator Mark Rubio, Congresswoman Debbie Wasserman Schultz, Congresswoman Ilena Ros-Lehtinen and Congressman Mario Diaz-Balart. ... We need to try something different or Alan will die in prison." As you know, the embargo against the Castro dictatorship is codified in U.S. law and cannot be lifted without an act of Congress. Sanctions must not be lifted unless and until free, fair elections are scheduled, political prisoners are released, and independent press, organized labor, and political parties are legalized. Perhaps they are correctly worried that the president might use his executive authority to suspend provisions of the embargo which are not in the national interest. The concluding paragraph seems gratuitous unless something is in play. We hope that you will affirm to us, in no uncertain terms, that you remain committed to longstanding U.S. policy which supports the Cuban people in their struggle for freedom while denying the pretense of legitimacy, and access to dollars, to their oppressors. If President Obama frees Alan Gross through direct negotiations, the letter signers will denounce that as providing the "pretense of legitimacy." If he expands trips by middle income visitors and back-packers with a general license for all people to people travel, they will condemn it as giving "access to dollars," even if owners of private bed and breakfasts are the largest beneficiaries. * "How America Does Latin American Coups in the New Political Era"
The days when U.S.-backed armed forces overthrew constitutional, democratically elected governments are long gone. * Are you reading the Capitol Hill Cubanos, a great spoof of Mauricio Claver-Carone's tendentious posts? * Opera de la Calle is performing in Canada at least until the end of August. Follow them on Facebook.